Thomas and Christiana's youngest daughter Christina May Langman married her next door neighbour William George Parker at Bermondsey Registry Office on 26th of June 1926. The certificate shows their addresses as being 35 and 39 Esmeralda Road Bermondsey. 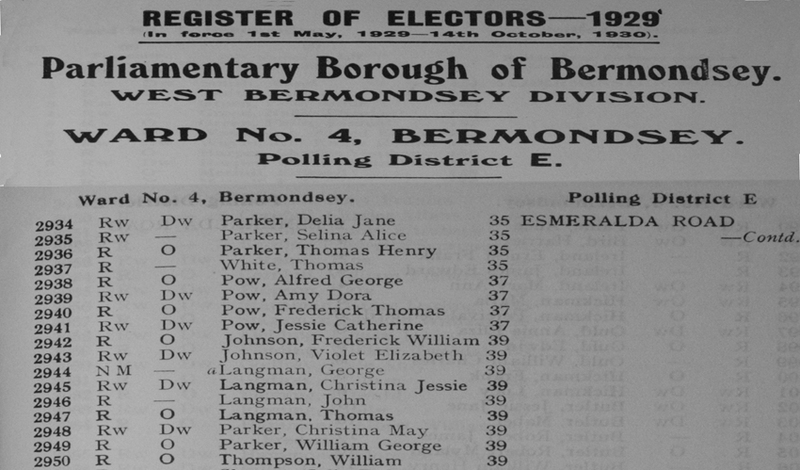 The 1929 Register of Electors (the year of the Wall Street Crash) shows the residents of Esmeralda Road between numbers 35 to 39. The Parker Family (William's parents) are living at 35. William Parkeris now married to Christina May. and living with her parents Thomas and Christiana. The Langman household at 39 Esmarelda Road now comprised of parents Thomas and Christiana (shown as Christina Jessie), their sons John and George and their newly married daughter and son in law. Also at 39 were Mr Thompson and Mr and Mrs Johnson who we presume were lodgers.